Here it is---My first Gluten Free blog post! I am thrilled that I will be posting gluten free recipes periodically. 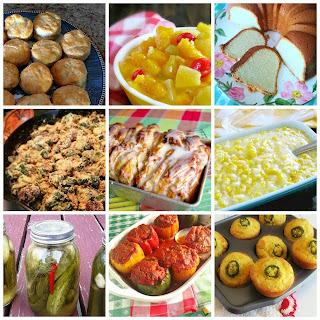 There are family members in my family that are gluten intolerant and welcome gluten free recipes.These recipes will have easy and accessible ingredients that can be easily adapted to gluten free. I was a little overwhelmed with all the wonderful gluten free ingredients that are out there and found some wonderful resources and incredible recipes on how to convert a recipe to gluten free. Now to my first recipe post! 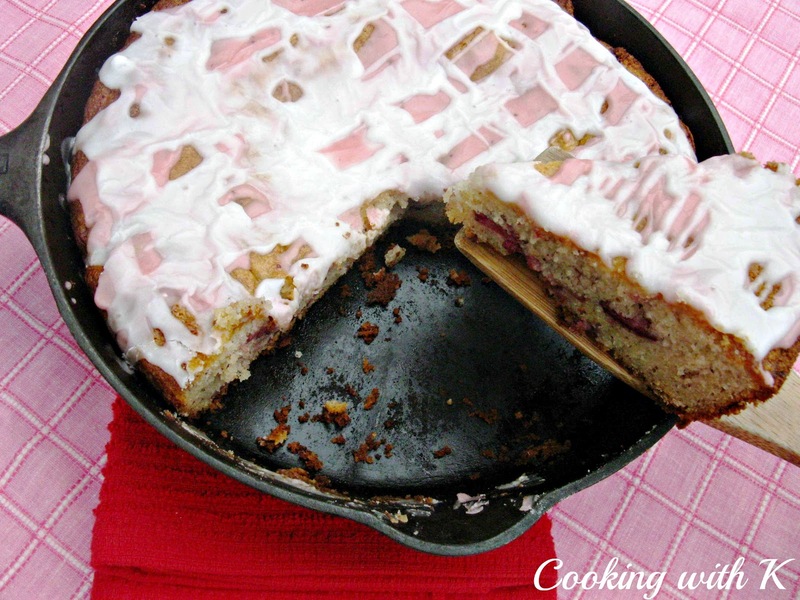 Although I maybe using a new ingredient concept, I am still continuing to use my old classic baking techniques using my cast iron skillet to bake this snack cake. 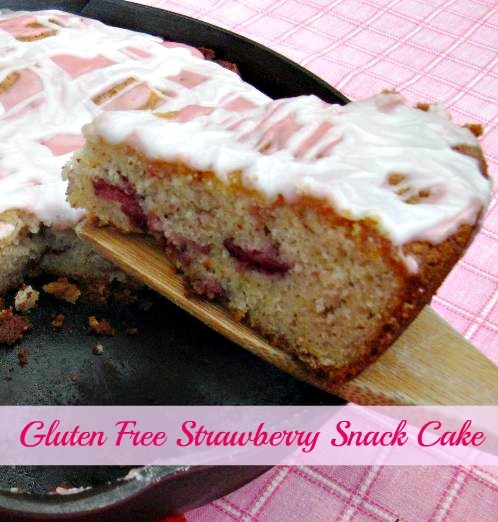 This is a moist and delicious Strawberry Snack Cake that is made with my very favorite gluten free baking mix. I can't say enough about this baking mix or in fact all of their gluten free products. You would not know this Strawberry Snack is gluten free had I not told you so. So yummy delicious! Preheat oven 350 degrees F. In bowl of electric Mixer using a paddle attachment, cream together sugar and butter until fluffy (about 5 minutes). Add eggs, one at a time, vanilla and almond extract; beat until creamy. Add baking mix and sour cream; beat until slightly mixed. By hand gently fold in strawberries being sure not to mash the strawberries. Spray with a non stick cooking spray in a 10-inch cast iron skillet or a oven proof skillet. Pour batter in the skillet and bake for 40-45 minutes or until done. Remove from the oven and cool 15 minutes before drizzling with icing. Mix all the above together a with a wire whisk until creamy and smooth. Drizzle over top of snack cake. Welllllll, I MUST try this recipe. I posted a recipe for a Buttermilk-Blueberry Breakfast Cake but I cannot think of anything beter than a Strawberry Snack Cake. Have made my copy and will make it soon. Most of our strawberries are coming from Plant City, FL, YUM. Looks yummy! And just in time for strawberry season ☺ I see that you will be posting gluten free recipes periodically, so when you do, I invite you to hop over to our recipe hop and link up. It is open every Sunday at 7pm and runs throughout midnight on Wed. Hope to see you there! Looks fantastic! I love just about Strawberry anything! Hi Kay! I am featuring you at my I Love Friday party this week :) Feel free to stop by and grab a featured button. I can't wait to see what you link up next! Have a great weekend! 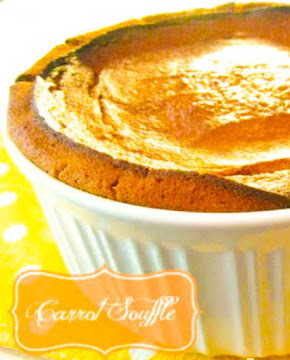 What a yummy recipe! 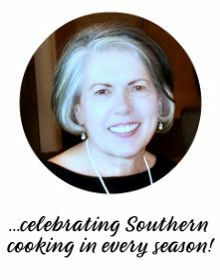 Thanks for linking up to Southern Sundays! Hope to see you again soon! This is beautiful, and yum!